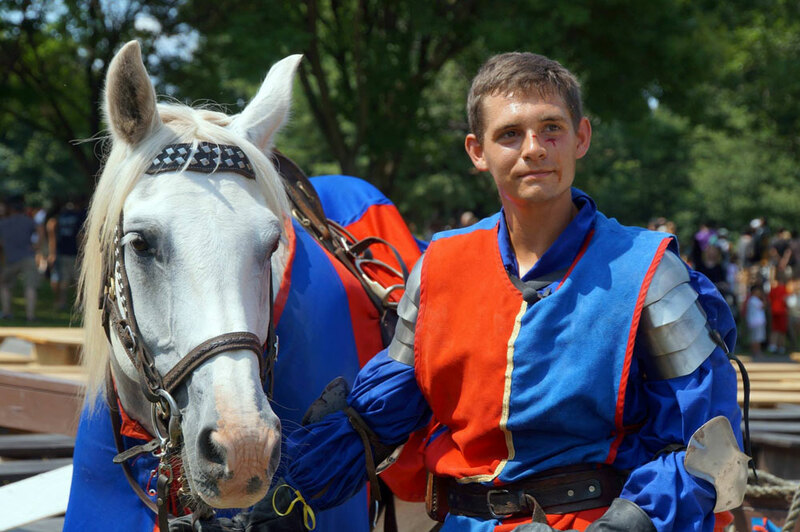 Jousting provided an unusual equestrian education for one rider. When I was a little boy, nothing was cooler than a medieval knight—charging down the battlefield, sword gleaming, armor glinting aboard a massive, thundering war steed like riding a bolt of lightning. That image took hold of my imagination and wouldn’t let go. Since then, I have always been in love with the mythology. When I was 17, I got the opportunity to work for a theatrical jousting company that performed jousting shows across the country. Needless to say, I jumped at the chance. I worked for the company from 2007 until 2016 as a stagehand and as a jousting knight. During my time as a knight, I learned how to ride. I can’t say it was the right way to learn, but the method of learning to joust and performing as a professional horseman impacted my riding skill in a way that could help the everyday horse enthusiast become more comfortable and confident, as well as improve overall equitation. I started out with the company as a stagehand and assistant. 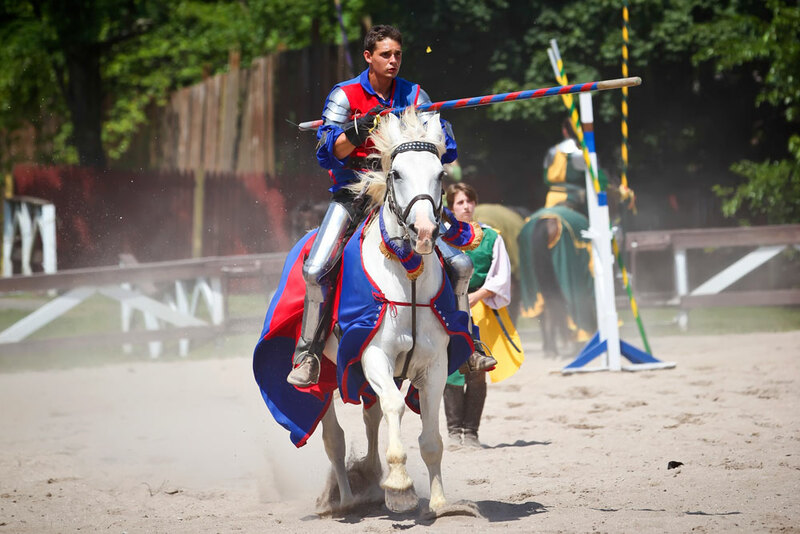 The position is anachronistically called “squiring.” Much like the medieval position, a squire is required to help the knights prepare for the show by grooming and dressing the horses, setting props, and helping everyone get into their armor. My time as a squire was really a formative time in my equine education. I’d taken a few riding lessons when I was a kid, where I would groom the horse and pick its feet before each lesson. However, the day-in, day-out grooming, tacking, untacking, and cooling down really made all it second nature. Having all that as my job accelerated the learning curve, and I became very effective at it while developing my horse sense. The same principle applied to how knights are trained in the company. I got my first chance to perform in the joust in 2012. I had been working with them for several seasons; I knew the show by heart, and I already had some of the riding fundamentals down. I ended up getting thrown into training two weeks before the show opened. Training for a knight boils down to the “sink or swim” principle. Once you get comfortable at the walk and can at least stay upright at the trot, you’re given a shield, helm and lance. We can all remember how difficult it is as a new rider to learn to post and maintain balance when wearing normal riding clothes. Now imagine holding a metal kite on your left arm, a 10-foot pole with your right, and a metal bucket on your head that weighs 8 pounds and limits your vision to a slit. The idea is that after spending hours bouncing around and suffering, you will eventually find a way to adapt. I was forced to figure out how to hold the lance, shield, and reins while still directing the horse. To do this, my seat had to get better right away. There was no friendly advice or soft couching, just “keep your heels down.” So I would try something out, and if it didn’t help, I tried something else. I did some research on my own and learned about lengthening my leg, using leg aids, and loosening up my hips. Under the stress, it didn’t take long before I found what worked. I discovered how much control I could have over the horse by just shifting my weight, which made directing the horse while holding all that equipment much easier. Once I was able to trot around with all my gear, it was time to start jousting. Jousting itself is a blast. It’s like being on a roller coaster. You set up on one end of the field and canter in a straight line to the other end, hitting your opponent or getting hit. It sounds like it should be the easiest part of the whole process, but that is where the real difficulties begin. Since the horses know the drill, once they are in position, or “in the hole” as we say, they tend to get excited. The joust pass itself, or charging down the lane, needs to be coordinated with your partner, so you can’t just rush into it. You must get into the starting position, wait for your partner to signal that he is ready, then take off simultaneously. I’ve had horses that would be so excited in the middle of a show that I would have to point them in the opposite direction of the lane so they wouldn’t bolt. Once my partner was ready, I would wheel and take off. As soon as I shifted my weight, the horse knew it was time to fly. One of my favorite memories is doing just that on a horse named Krishna, an Arabian-draft cross. He’s a magnificent horse with size-four hooves that sounded like a freight train galloping down the field. He would rear up as he spun 180 degrees and charge into the pass. Talk about a rush. Later, when I started developing my riding skill beyond jousting, I found that these lessons paid off. Being forced to adapt to an uncomfortable situation not only gave me confidence, but I developed by necessity an independent leg, soft hands, and solid balance. When I was teaching new knights to ride and joust, it was hard to watch how frustrated they would feel while suffering to learn everything. Everybody wants an answer, the quick secret. Like if they changed this one thing about their riding, then suddenly they would have perfect balance. It just isn’t the case. There are some things in riding that you have to learn through time in the saddle. Some lessons you have to feel for yourself. That was the strength of learning to joust for me. I developed an independence that allowed me to have confidence when trying something new, even if I failed at it. I could test something out, and if it worked I would implement it. If not, oh well. In riding and in life, sometimes we just need to jump into whatever it is we are trying to learn and figure out how to swim. Don’t focus on all the things that might go wrong, just dig in to the problem and find a way through. Take it head on, like a knight thundering down the battlefield, riding on a lightning bolt.